Wave to Wave is a performance boating magazine, featuring opinions, technical articles and restoration stories. Gearcase design is somewhat complicated, but in this article I want to talk about some key things that will help make you faster, safer, and more efficient. One of the challenges with our Project 150 Mercury four stroke is the stock gearcase doesn’t have a low water pickup. For large number of consumers, this is not a problem. 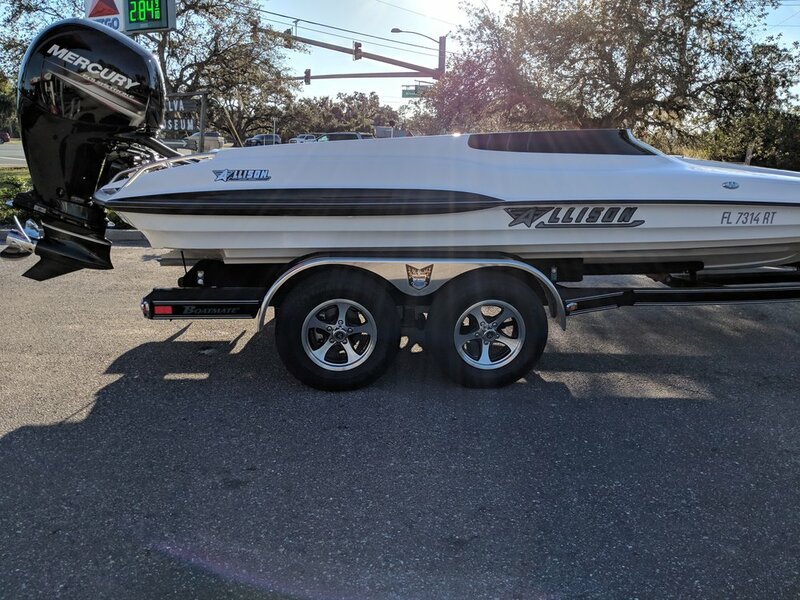 But, for those running a lighter faster hull, looking to squeeze more speed out of any stock engine, a low water pickup is a must. 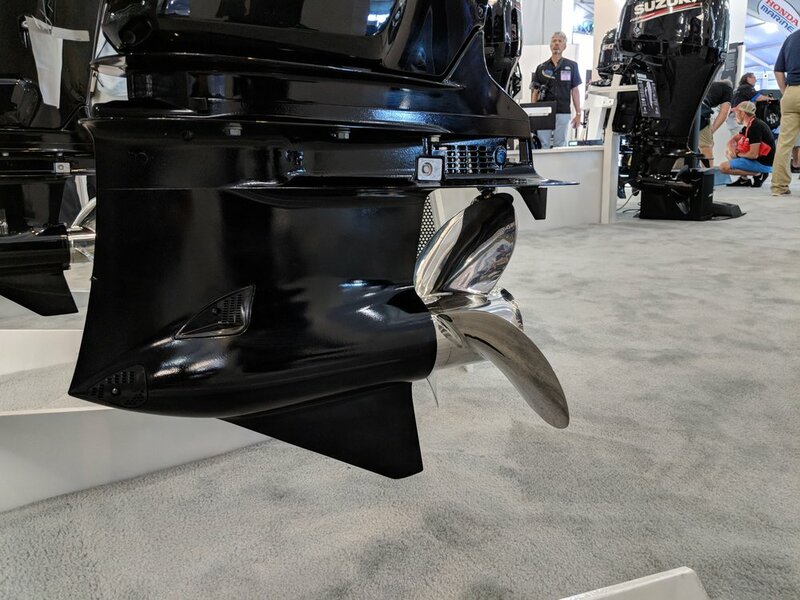 Beyond the low water pickup, there is also the consideration of how the gearcase itself will respond to being run higher out of the water, and the faster you go, the higher it will need to be. The gearcase design becomes critical to handling and safety. When setting up our Allison Grand Sport, I got to spend quite a bit of time with Darris Allison, and he shared many thoughts on gearcase design with me. I wanted to share some of that information, and some general ideas here. Basically, only Mercury Racing, and Seven Marine make a proper OE gearcase that is designed to surface. For good reason, the Mercury Racing Sport Master is ubiquitous, and has been a mainstay in the Mercury Racing lineup for a long time. Our Mercury 150 four stroke on our Allison, had a very basic gearcase. There are some aftermarket kits that include a nosecone, and lower water pickup at the front of the cone. This one is much better than stock, but is a little long, and we will probably round out pointy tip, as well as smooth out the water inlets. The Mercury Racing Sport Master design has changed over the years, and was seen in iterations of the 2.5L, 3.0L, 3.2L, and Verado R engines, as well as Bravo XR drives. The advantage the Sport Master had over earlier performance gearcases was the torpedo shape which improved high speed dynamics, water pickup design that helped with water pressure, and flow around the gearcase. Also, importantly, the internals were stronger, as well as offering different gear ratio options. Later model Sport Masters had a larger shaft to accommodate higher horsepower engines. One element of running the gearcase in a surfacing situation is that there is a risk of blowing out the propeller, where the prop experiences a lack of water pressure on the blade surface, and slips, leading to a sudden loss in thrust. In a surface application, the water is highly disturbed, so even a very tiny change in design, can have a large effect on how the prop will perform in these conditions. The venerable Sport Master, has a really good shape, designed to run in excess of 85 MPH and well into the 100 MPH range. Notice how it is not too pointy. The latest 1.75:1 version here on the Mercury Racing 300R. When experimenting with boats going over 100 MPH, there are a few considerations that can lead to blowout. To the eye, a really pointy gearcase looks good for high speed, but that is not the case. The reason is very similar to why you don’t see pointy noses on subsonic aircraft. The goal is to reduce parasitic drag, which is a result of form drag and interference drag, directly related to the shape of an object. A pointy tip disrupts the water too much, by creating a sudden change in direction of the water. On top of that, the pointy tip is longer, increasing drag. With a rounded parabolic nose cone, you reduce drag, with less surface area, and the the water becomes less turbulent as it goes around and reaches the prop. Put simply, the rounded nose cone breaks the water better. Although the Seven is not really a high performance engine, you can get it with this performance lower. The pointy cone on this looks cool, and that is what’s important. Darris told me how they tested this in real time, by literally blunting the nose of a pointy gearcase by cutting off the tip, and rounding it out. A ½ inch ball bearing size nose approximately. In most cases this improved top speed dramatically when previous attempts would blowout at speeds above 100 MPH. If you want to get really detailed, the water inlets are also important in a few ways. One, the shape of the water inlet effects how much water pressure you will get. And, it also determines how much water disruption there is. A smooth oval shape water inlet is the most efficient, allowing water to change direction, as opposed to a flush round inlet that forces the water to change direction. Furthermore, some aftermarket gearcases have multiple thin water inlets, but in reality, you don’t need more than three. 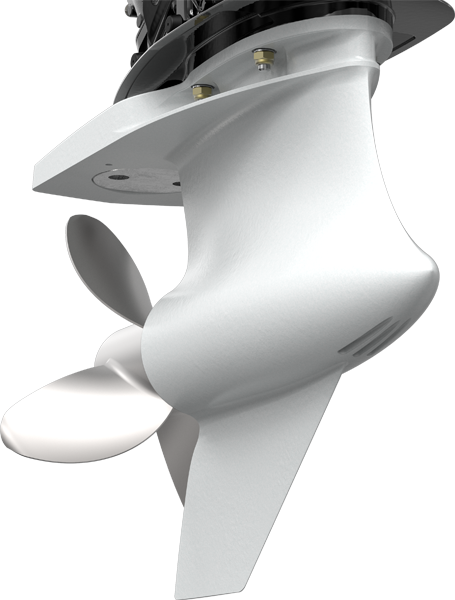 Another factor to consider is when the water inlet is too far up the side of the gearcase, on the side of the propeller down stroke, the inlet actually disrupts water flow to the prop. For example, in a right hand rotation, the right side of the gearcase should not have a water inlet much beyond the centerline, as the that creates turbulence for the water as it approaches the prop. You can simply fill in the right most water inlet to alleviate this, in some cases. Notice the filled water inlet on the cone on the right. The prop down stroke is on that side, where you want smooth water flow. 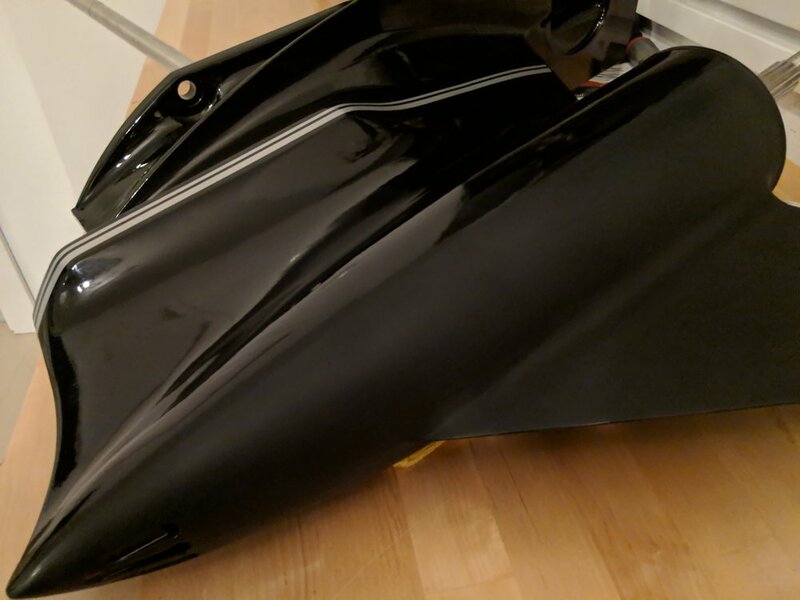 If you are already installing an aftermarket kit, This should be a relatively simple fix, you can fill the prop side water inlet, round off your tip, and improve the dynamics of your gearcase. Even though it is more critical in 100 MPH + applications, it is beneficial in all scenarios where you are surfacing your gearcase. The 150 ProXS gearcase is better than the stock 150 in that it has low water pickups. The shape is probably okay for most boats that are running this engine. Would love to test it on a light hull. In many instances, a stock gearcase with low water pickups alone will be better for you than one with a pointy tip, which will slow you down, especially below 85 MPH. If you’re only experiencing a small water pressure loss, simply fill your top inlet, or add scoops, or improve the shape of the lower inlets in some cases. Be sure and keep careful measurements of your gearcase height in order to get a baseline, and test from there. This is a Suzuki 300 gearcase. It would be interesting to see the limits on this, as the shape looks pretty decent for a stock design. The lightweight Allison needs the gearcase run really high to reduce drag, in order to perform. A basic nose cone kit from Bob’s Machine shop, everything you need. You could easily fill the right inlet, and round out the tip to improve upon the design. These are pretty good out of the box though. The external water line is not the most attractive, but it works. 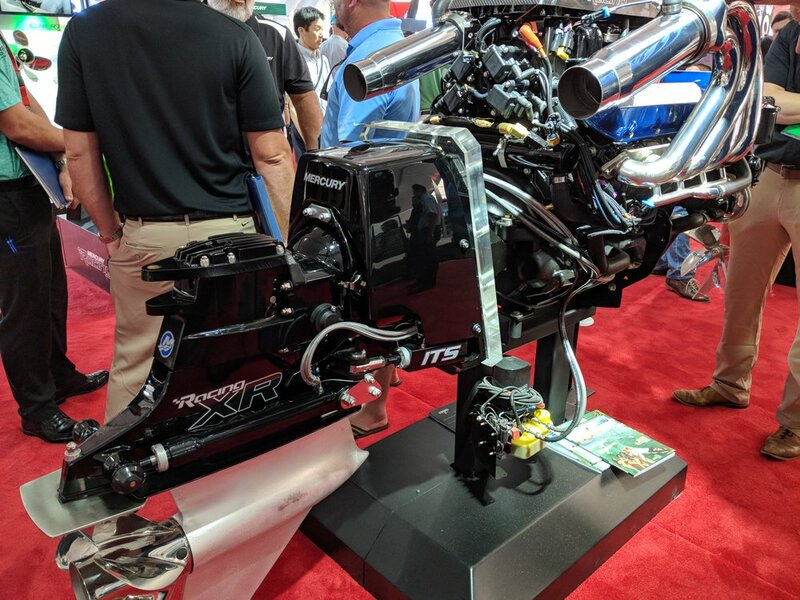 Mercury Racing XR drives utilize the Sport Master design for boats exceeding 90 MPH. 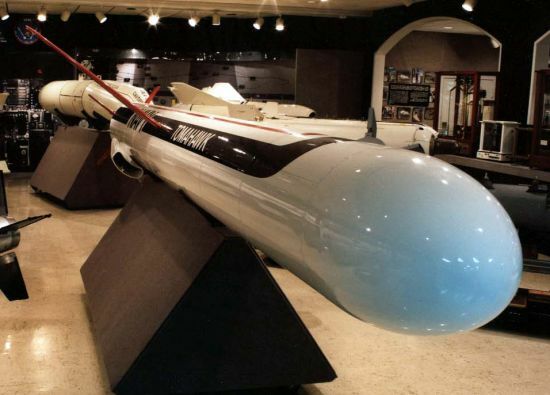 A Tomahawk missile features an elliptical shaped nose, which is the predominant design for subsonic aircraft, which reduces friction drag at specific speeds.